This information is intended to be helpful. I am happy to include anyone offering a genuine local service for the benefit of the community and visitors. Inclusion on this website is free of charge. When is Saltaire open - and how much does it cost? 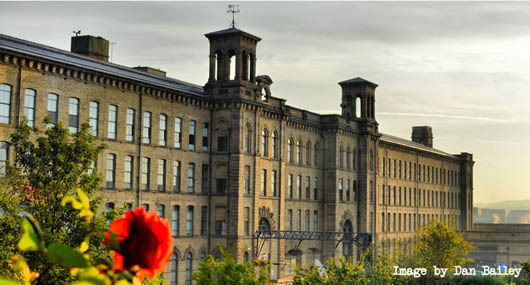 Saltaire is a village where people live, so is OPEN EVERY DAY for visitors. You don't have to book to come here, and there's no charge. Salts Mill is the main feature of the Village and is open every day, except Christmas Day, Boxing Day and New Year's Day. It is free to enter. 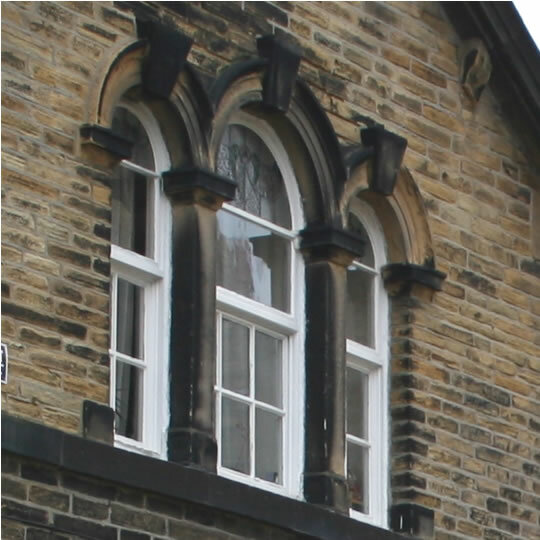 Saltaire is built in the Italianate style, giving it an enduring beauty and charm. 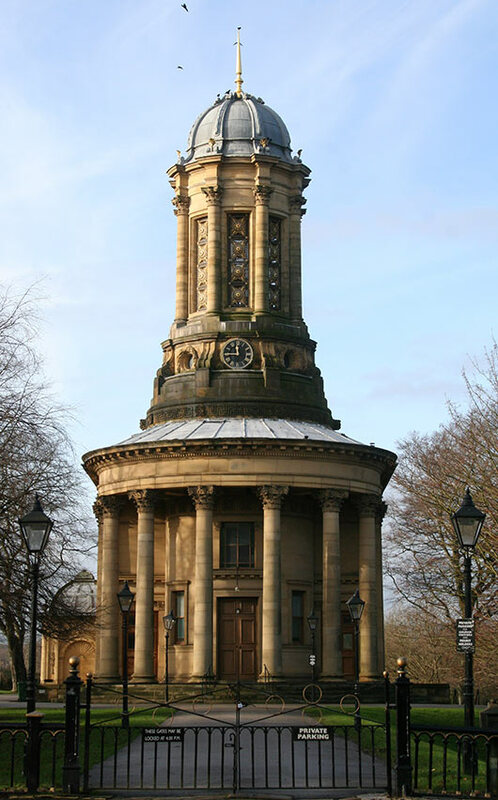 In December 2001, Saltaire was designated a World Heritage Site by UNESCO. You are free to wander around. There are places to eat, some shops, and a lovely park and adventure playground for the children. Saltaire Village is located in England on the outskirts of Bradford, West Yorkshire, and owes its name to Sir Titus Salt, a textile magnate and philanthropist who built a mill and a village for his workers by the River Aire. Salts Mill was a masterpiece of its time and was hugely productive, turning out 18 miles of worsted cloth a day on 1200 looms attended to by 3000 workers. It was opened on 20 September 1853, Titus Salt’s 50th birthday and was celebrated with a banquet for his workers in the Mill’s combing shed. The Mill changed hands - the textile industry faltered and the Mill closed in 1986. The following year it was bought by local entrepreneur, Jonathan Silver, who transformed it into a place of art and commerce. Jonathan died in 1997 aged only 47, though the Mill remains vibrant and in the care of his family. The third floor is closed Monday and Tuesday, and open Wednesday to Sunday and Bank Holidays. Indvidual retailers in the Mill have different opening hours, so call them to check prior to your visit, or call Salts Mill on 01274 531163. 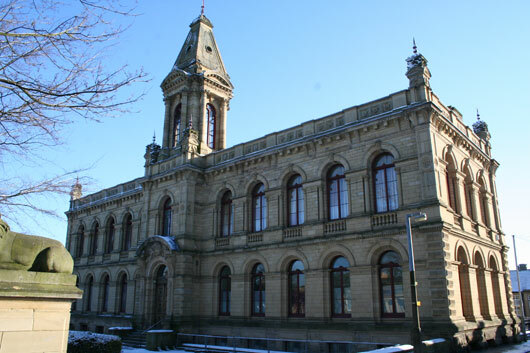 Saltaire is 4 miles north of Bradford, 15 minutes from the M606 and the motorway network. Follow the brown road signs from the motorway. The Saltaire train station is just across the road from the Mill. It takes 15 minutes to Leeds or Bradford. Sat nav users: entering our correct postcode brings you into the wrong side of the Mill for the car park. Instead, please set your Sat Nav to BD17 7EF. When it tells you you've reached your destination, keep going along Salts Mill Road following the brown signs - you'll pass a big red brick chimney on your left as you cross the canal and The Waterfront, an office building, on your right, then you'll see the mill at the end of the road. Proceed through the gates into the free Salts visitors car park on the right. School parties and other groups are welcome to visit Salts Mill. Please contact us in advance to book. Download the Salts Mill information sheet. Come along Salts Mill Road, pass the 'Visitors Parking' sign and continue past the chimney where you will see a glass canopy with disabled parking spaces. Level access to all public areas and the lift is through the tunnel opposite these parking spaces. For additional information or help please call 01274 531163 during opening hours. Showing commissioned artwork in our collection and the Saltaire History Exhibition. Go right through to the end of the Gallery to reach the History Exhibition and Carlton Antiques. The finest outdoor gear for adults and children. A detailed study of the changing seasons on Woldgate near Bridlington, East Yorkshire, between 1st January and 31 May 2011. Light bites and lazy lunches surrounded by David Hockney's unique mural. 10,000 square feet of wheels! An independent family business run by cyclists for cyclists. 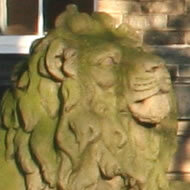 Located at the front of the Mill, just off Victoria Road. Salts Mill is Italianate in style and was designed by the architects, Lockwood and Mawson. It is 545 feet long – exactly like St Paul’s in London; 6 storeys high and 72 feet high. The glass covered engines which powered Salts Mill were visible from the railway - an incredible sight for train passengers. The top floor runs the whole length of the building. The engineer was William Fairbairn of Manchester who introduced health and safety features into the mill. The mill is built with non-combustible materials: stone floors and staircases. Beneath the mill is a tank to hold 500k gallons of rainwater.On top of the warehouse is a tank holding 70k gallons drawn from the river, in case of fire. The weaving shed covers 2 acres and housed 1200 looms. 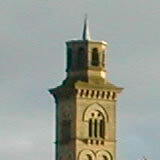 The warehouses form the letter T. Salts Mill chimney was 250 feet high with a decorative campanile (the campanile has been removed for safety reasons). The Mill was very productive. It produced 18 miles of fabric a day, or about five and a half thousand miles every year. Inside Salts Mill you will find the paintings of David Hockney and others. There's so much to see! There's a permanent exhibition of the Story of Saltaire. Jonathan Silver bought the mill in 1987 when it was in a state of disrepair and brought it back to life. He was especially interested in fashion and art - he had previously owned a string of boutiques. He died at the age of 47, ten years later. The Mill is now run by his widow, Maggie Silver with other family members. The Silver family is held in great esteem. 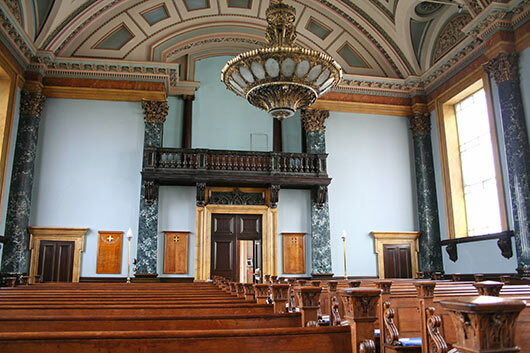 Victoria Hall hosts events, classes, weddings, craft and vintage fairs, table top sales, etc. The staff are very welcoming. It is a beautiful building in the shape of a T, with a garden in front, flanked by stone lions by sculptor, Thomas Milnes. Look out for the sculptured faces of Greek Gods and the gargoyles guarding the buildings on each corner. This Mighty Wurlitzer, owned and maintained by The Cinema Organ Society, is housed in the main hall of the Victoria Hall. 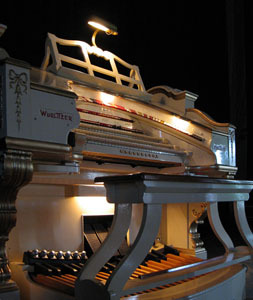 In addition to a programme of regular monthly events, the Wurlitzer can be hired for private functions and is also played several times a month by members of the society. Why not call in at the Hall and see if you can catch the Wurlitzer in action – you might even see the console rise up to the stage on its lift! Small groups can be given a tour down in the bowels of the organ to view all the pipes, drums, cymbals and the mechanisms that make up the instrument. The Saltaire Trip Boat is located at the bottom of Victoria Road, adjacent to The Boat House restaurant and Roberts Park. It's a new business and support is greatly appreciated. The trip along the canal is delightful. The boat is available for private parties. Saltaire [Leeds to Liverpool canal] found at the bottom of Victoria Road. March and October - Daily, depending on the weather. Dogs are very welcome providing they are accompanied by a well behaved owner! We are always pleased to accept school & special bookings at other times. Please email us with your requirements and we will see what we can do. The Shipley Glen Cable Tramway is the oldest working cable tramway in Great Britain (cliff lifts excepted). Dating from 1895, the line was built to serve the local beauty spot of Shipley Glen near Saltaire in West Yorkshire. 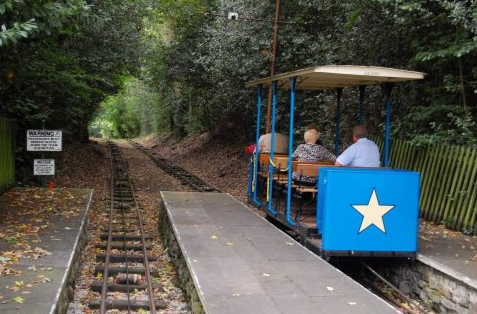 At nearly a quarter-mile in length, the woodland ride provides a pleasant alternative to the steep path. The museum at the bottom station displays photos and memorabilia of the tramway as well as Shipley Glen. Entry is free of charge. The Shipley Glen Tramway is located behind Roberts Park in Saltaire (located at the bottom of Victoria Road). Walk throught he park, exit at the rear and cross Higher Coach Road. Follow the footpath located to the immediate right of Titus Salt School. The Tramway is at the foot of the hill. Foundation stone was laid by Caroline Salt in 1856 and the church was opened on 13th April 1859. Designed by Lockwood and Mawson. Italianate in style with the appearance of a temple with Corinthian columns. Seating capacity for 600 – interior devoid of religious imagery. Titus Salt's initials TS are carved in the (interior) plasterwork above the windows. The mausoleum was added in 1861. A Grade I listed building. You can gain access into the church by contacting Len Morris: email len.morris@talktalk.net Tel. 0(44)1274 597894. On the left, notice the mausoleum attached to the side of the church, opened in 1861. Titus Salt's daughter, Fanny, died at Methley Hall on 4th August 1861, just days before her 20th birthday. Her body was placed in a temporary vault in the church, then interred in the completed mausoleum. On the way home in the carriage with his friend, the Rev. Robert Balgarnie, Titus said sadly, “I could have lain down with her.” Titus and Caroline Salt's young children, Whitlam and Mary, both died in 1851. They were exhumed and brought to Saltaire. The mausoleum is also the resting place of Titus Salt, his wife Caroline and other family members. Here's a picture of the interior of the URC, showing the beautiful ceiling, the hollow Corinthian columns with Scagliola exeteriors. Inside are hollow Corinthian columns with beautiful Scagliola (imitation marble) exteriors. Two ornate chandeliers, originally lit by gas, hang from the ceiling. They are so heavy, additional roof trusses had to be inserted to support them. 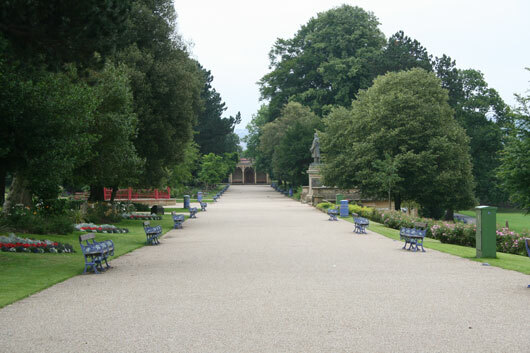 Originally known as Saltaire Park, it opened on 25th July 1871. By this time, Saltaire Village was almost complete. Work stopped at the Mill so the workers could attend. Sir Titus Salt was there with his son, Edward and his daughter Amelia. Titus was 67 years old and his health was failing. He apologised for his wife's absence. Edward spoke to the crowd and Amelia declared the park, open. The church bells rang, people cheered and the Volunteers fired their rifles. The band finally played the National Anthem. Sir Titus walked with a stick round the park. The park is 14 acres of lawns, with lovely walks and flower beds. There was a music pavilion for the band, space for cricket, croquet, archery, boating, bathing and swimming. It was free for all to enjoy. No alcohol. No gambling. No profane language. No religious or political demonstrations without special permission. Walking instructions for a circular towpath walk in Saltaire, taking in Shipley Glen, courtesy of Danny Jackson. We do not recommend commerical guided walk companies at this time. At present there are no Blue Badge guides for Saltaire. 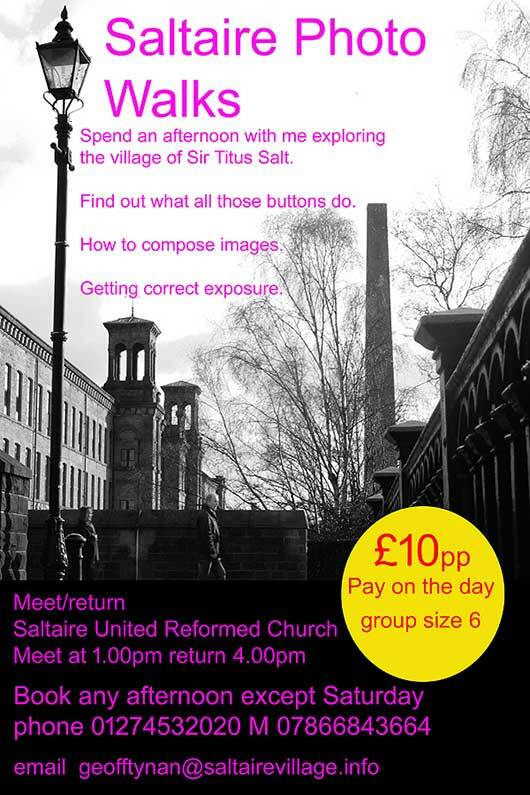 You may have heard about the "Rules of Saltaire Village". Some of them have been debunked.. There are also entertaining myths peddled about Saltaire, but there are not based in fact. Here are a number of myths that are peddled about Saltaire. Unsourced rules of the Village and the Mill. These have been represented as "authentic" and "official". These rules were written a few years ago by a local man for sale to tourists and no known source exists. Daisy Place, Fern and Myrtle Place were named after Sir Titus Salt's maids. Sir Titus Salt had illegitimate children. Streets were to be named after Titus Salt's parents, Daniel and Grace, until he quarrelled with them. The church chandelier was placed to obstruct Lady Caroline's view. The bust in the church was placed to aggrandise Sir Titus Salt in his lifetime. The urine of red-headed girls was collected separately and used in the textile industry. 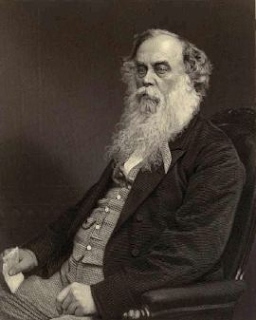 Titus Salt destroyed the records of Salts Mill. Download the original plan of Saltaire drawn from present day Ordnance Survey plans, courtesy of Nemine Juvante (Saltaire) Publications. You can download and print it. Don't have Acrobat Reader? Download it FREE. Interested in photography? Spend an afternoon with local photographer, Geoff Tynan, exploring the village of Sir Titus Salt. Find out what all those buttons on your camera do! £10 per person (Group size up to 6). Pay on the day. Meet / return Saltaire United Reformed Church, Victoria Road, Saltaire, 1pm to 4pm. Book any afternoon except Saturday. The festival began a decade ago, instigated by local people who worked extremely hard to get the festival up and running with a wonderful vibe. It takes place every year around the time of Sir Titus Salt's birthday, 20 September, and goes on for around 10 days. It features local participation, concerts and events, a continental street market and street entertainment and music. If you can't get here in person, you can be a virtual explorer of Saltaire with Google's new World Wonders Project. Explore!